Not sure about your weather but our weather is sure feeling like fall. This has me in the mood to create some fall projects. I posting again for Silhouette Challenges "Holiday Home Decor" Challenge. WOW this is amazing-- I love all the tiny details and Especially the embossing!! 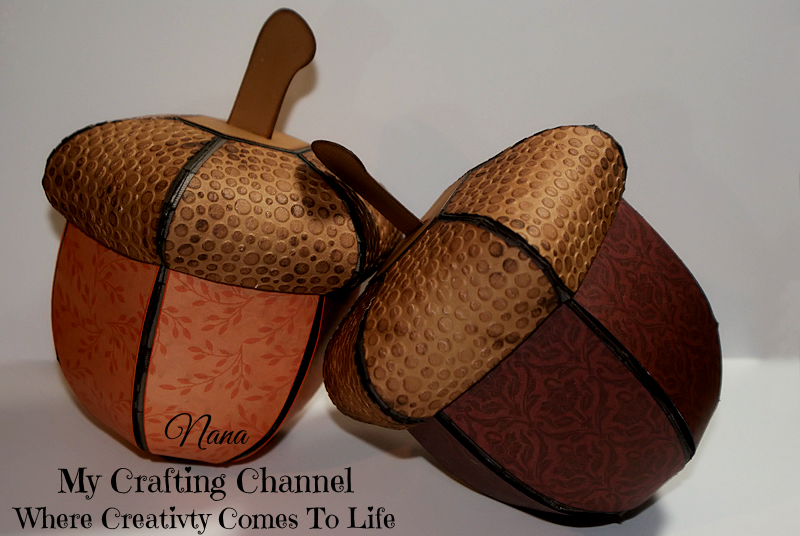 I just absolutely love these beautiful acorn boxes! Love acorns period! The embossing you did on these look awesome! You are certainly the queen of box making! I definitely want to make some of these! Thanks Sis...I love these. The will look awesome in my kitchen. What a beautiful set. Gorgeous. Lifelike and no wonder your sister wanted a set. I can certainly see why your daughter and sister wanted a set of these each, they are absolutely gorgeous and that embossing looks amazing on them. What a beautiful project!!! Love the embossing simply love these!! Have a great day. OMG These are fantastic!! I am making these as we speak. Love the embossing you did. Thanks for stopping by and playing along with our Anything but a Card challenge over at Craftin' Desert Divas. The acorn boxes are fabulous! I don't have a silhouette though, so was wondering if there are other options to obtain the same result?